Hello everyone and welcome to the July Tour de Freaks! Many of Freaks are off at convention (which is just finishing up) but thanks to the wonder of the blogging world whether you are exhausted from a great convention or having a great time at home stamping with friends you are in for a treat. If you are going forward through the hop you arrived here from the very talented Debbie Henderson and her Debbie’s Designs blog. I just LOVE her stuff! If you follow my blog at all you know that I just LOVE CAS (clean and simple) cards. I like lots of ‘white space’ on my cards and often my ‘white space’ is just that….WHITE! 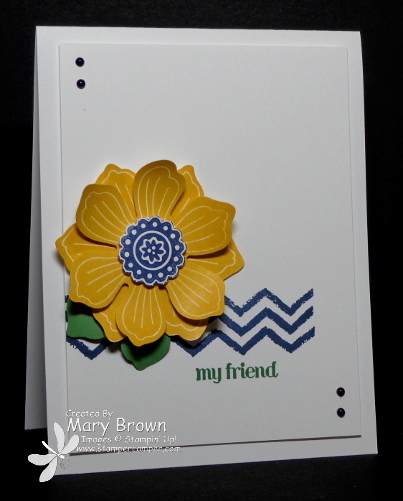 For this card the base is 4 1/4 x 11 folded. The next layer is 5 x 3 3/4 I stamped the chevron from the Work of Art stamp in Night of Navy, my friend from And Many More in Garden Green. The panel is added using dimensionals. The flower is stamped in Crushed Curry – two times – punch out and layered, the center done with Night of Navy and the ‘leaves’ is the same flower punch in Wild Wasabi. I colored some Basic Pearls with my Night of Navy (darkest) blendabilities and add to the card to finish off. So for my next project I used the same make up for the flower. The card base is Night of Navy 4 1/4 x 11 folded. I took the Night of Navy polka dotted dsp from the Regals paper pack. One strip 5 x 1 1/2, middle is 5 x 3/4 and smallest is 5 x 1/2. These panels are added using dimensionals. Whisper White is 1″ x 4 1/8 with a 1/8″ Crushed Curry strip on it, cut into a banner, stamp the greeting using Garden Green and add to card front. Like I said the flower is done the same way as above and added using dimensionals. Finally I colored some pearls using the Daffodil Delight Blendabilities (middle one) and add to the card front. And now for my 3D item. We wanted to do a little thank you gift for our helpers at Create with Connie and Mary LIVE last Saturday. I found these cool memo pad holders at Michael’s and thought they would just be perfect altered and they are just SOOOOO cheery! The memo pad holder was Night of Navy with the fun white dots on it. I wrapped a piece of Hello Honey Stitched Satin Ribbon then a piece of the Silver 1/8″ Taffeta Ribbon aroun dit. I make a flower (same as above) EXCEPT for the center I used the ‘dotted’ center from the Beautiful Bunch set on Night of Navy and White Embossed so that it looked like the background. The pen has a piece of the Crushed Curry Dotted dsp inside. Now it’s time to head over to Justin’s jk cards blog! He is sharing his convention swaps with you. This entry was posted in 3D, Tour de Freaks and tagged And Many More, Bloom for You. Bookmark the permalink. 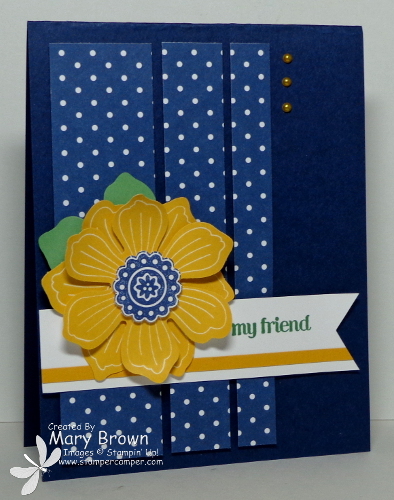 Oh Mary….your cards are fabulous and love the memo holder….love polka dots so that always reaches out to me! Your flowers are fab! I also love CAS card designs…you nailed it on the first card and actually on the second one without using ‘white’!! !